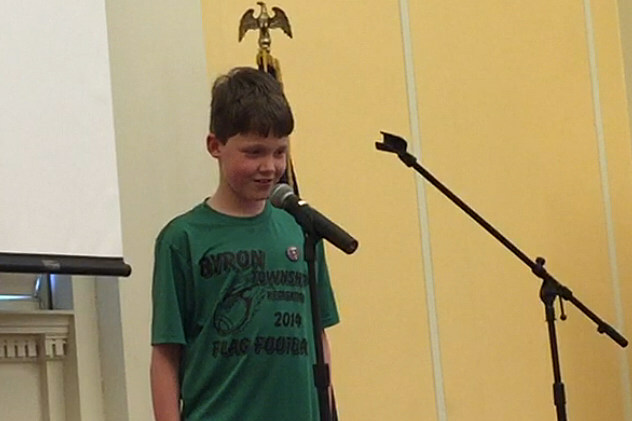 Hilarious, brave kids took the stage at Grand Rapids Public Library last night for LaughFest‘s second of three Kids Joke Night events. Kids as young as three took grabbed the microphone for a variety of jokes. There were full stand-up routines, knock-knock jokes, new twists on old classics and it should be no surprise there was a little toilet humor too. Now that Burger King doesn’t have happy meals, the meals don’t make me happy anymore. I’ll just sit in the back of my dad’s car and play with the cookie until I make a big mess. I just farted…give it a minute. Why did the turkey cross the road? To prove he wasn’t a chicken. Did you hear the joke about the roof? Never mind, it’s over your head. A man walks into a bar…OUCH! What kind of nuts always catch a cold? Ca-SHEWS! Knock-knock! (Who’s there?) Interrupting sloth. (Interrupting sloth who?) ………….. The third and final Kids Joke Time event of LaughFest 2016 will be held at Herrick District Library in Holland at 11AM on Saturday, March 19. The event is free and pre-registration is not required. All kids are welcome on stage to tell jokes.